The dog had me up at the asinine hour of 6am yesterday. Okay, 6:40am. Still, for a Saturday (and perrrrrfect sleeping weather) with nothing on the agenda, that’s a nightmare. Knowing she wouldn’t leave me to sleep in peace, I retreated to the coffee pot and started working on recipes for the cookbook. I’ve been short on time, and somewhat on inspiration. 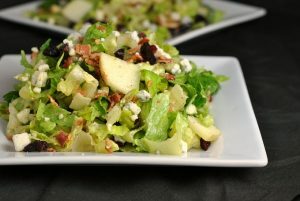 Cooking is like writing…you have to jump when the mood strikes. A lot of my cooking inspiration lately has been coming from my fridge/freezer and my CSA…using what I have on hand. A novel concept, I know. A concept I am not so good at grasping. I’ve had just a bit of ground lamb in my freezer for probably the last 6 months and the tomatoes and cilantro from my CSA were nearly on their last leg. As for the hummus, that was leftover from my hockey get-together last weekend. The spicy hummus was a hit – the original…not so much. I’m not complaining. I needed to buy very little for this recipe which is precisely what lead me to try it. The good reviews online helped, as well. In true Mr. Prevention fashion, he was a fan of this…”because it was in pizza form” (his words, not mine). While I can’t win every dinnertime battle, I have learned through trying pizza in many forms, that pizza and pizza-like meals are always acceptable to the man. Pepperoni Pizza Quesadillas – loved ’em. Portabello Mushroom Pizzas – gobbled ’em up. Quinoa Pizza Bites – sold. Cobb Salad Pizza – Yes, please. Pizza Burgers – Of course. Pizza Tacos – Naturally a, “Yes, please”. Pizza can take on so many forms and to date, they are all still more than acceptable in everyone’s eyes. 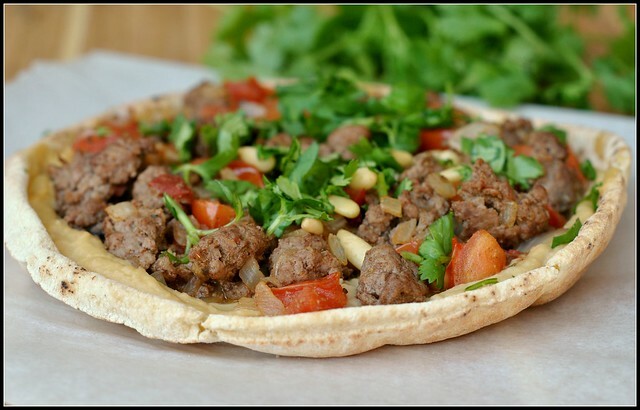 Ground Lamb and Hummus Pita “Pizzas” can be added to the list of pizza successes. 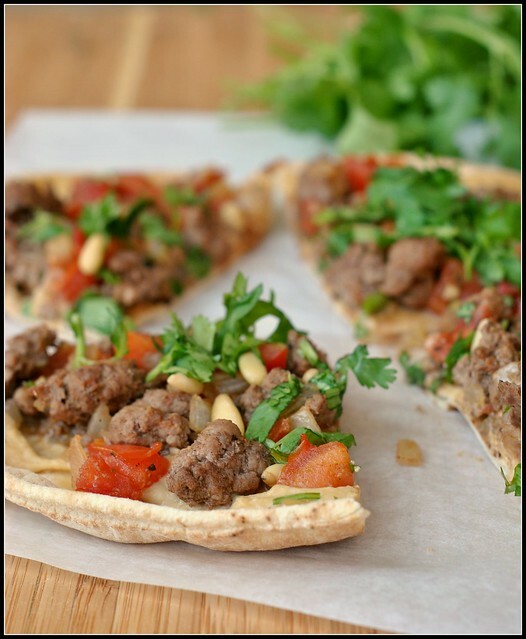 This fun Middle Eastern twist on pita pizzas make for a fun and unique, let quick meal idea! Preheat broiler to 550 F.
Heat a large nonstick skillet over medium-high heat. Add lamb to pan; cook 4-5 minutes or until browned, breaking up with the back of a wooden spoon. Remove lamb from pan. Add oil to the now empty skillet; swirl to coat. Add onion to pan; sauté 4 minutes. Stir in garlic and next 4 ingredients (through cinnamon); sauté 1 minute. Stir in water and tomato; bring to a simmer. Cook 4 minutes or until tomatoes begin to soften. Stir in cooked lamb. 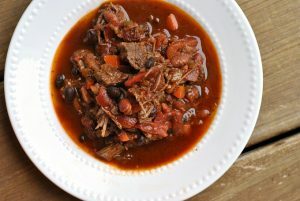 Cover, reduce heat, and simmer 4 minutes. Stir in the lemon juice. Place pita rounds on a baking sheet. Broil 1 minute on each side or until crisp. Spread 3 tablespoons hummus on each round. Top each serving with half of the lamb mixture. Sprinkle evenly with cilantro and nuts. Sorry this weekly menu is so boring 🙁 Busy week ahead. YUM – I love lamb! Congratulations on your cookbook progress!! That’s great Nicole, especially to get 3 done in one day… Let alone by 9:30 am! And we’re huge pizza fans too. I like using untraditional crusts, like tortillas, naan, and pitas too! I wonder if I could get my guy to go for pizza quinoa bites… It might be a stretch, but who knows!